A hydrostatic line tester is considered to be a reliable and device that can be used in sprinkler testing. This type of machine is the perfect type of equipment for testing the leakage and integrity of plumbing and pipe equipment, which may be essential to your business. The hydrostatic line tester, used for sprinkler testing, is already fully serviced and tested when you buy it. This means that as soon as you receive your hydrostatic line tester, it is ready to use. The hydrostatic line tester is designed to test the integrity of plumbing, sprinkler systems, and pipes according to specific requirements of local codes. The user of the hydrostatic line tester is able to pump water into the sprinkler system itself. That system can then be locked, and the pressure can be set according to your needs. Once you get started, your hydrostatic test pump will begin measuring to see if there are any leaks within the system of pipes and sprinklers. 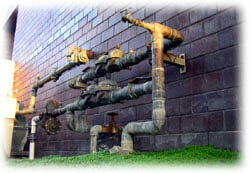 This type of system that can be used in sprinkler testing is ideal for rental yards, contractors and city maintenance facilities. There are several different types of hydrostatic line testers to choose from. The Hydrostatic line testing R-EL Electric Series is designed to be used for the testing of small water lines or sprinkler systems. It holds both a lower volume and produces less pressure than other larger models on the market. The Electric Series is perfect for handling sprinkler testing because of the lightweight compact design that can be used both indoors and outdoors in many different types of operations. It gives you the level of flexibility that you need. These models get great readings that are both even and precise because of the equipment they’re using. For example, the gauge is made from stainless steel then filled with liquid to ensure a perfect reading every single time you use it. There are no exceptions. The electric motors on this series come in lots of different voltages, and if you need something stronger, look into the explosion proof types to create a measure of safety. The different applications that the R-EL Electric Series can be used for are sprinkler testing, irrigation line testing, the testing of plant piping and testing pressure vessels. The Electric Series hydrostatic test pumps can be used on a number of different work sites, which means you may have a level of flexibility that your competitors don’t. Two popular models that are included in the Electric Series are the R-EL-1 which has a ½ HP, single phase engine. The R-EL-1 hydrostatic test pump has 3 GPM and 50-300 PSI. This is a great piece of equipment to perform sprinkler testing. Another hydrostatic pump that is part of the Electric Series is the R-EL-1A. This test pump has a 1 HP engine, 1.5 GPM and 150-1000 PSI. There is free shipping on any of the above mentioned hydrostatic test pumps that are part of the Electric Series. The many features of the Electric Series include a brass unloader valve to regulate pressure, high pressure ball valve to isolate test pressure, pressure test gauge, adjustable pressure, fully adjustable regulator, eight foot high pressure hose and a nine foot inlet hose with stainless steel strainer. There are many more features that satisfied customers love about the sprinkler hydrostatic test pump models in the Electric Series. The two above mentioned hydrostatic pumps are perfect for performing sprinkler testing and other applications.